Before or after exercising, your body will thank you for this deep massage that alternates hot and cold feelings so as to activate circulation, promote muscle recovery, and free up joints. 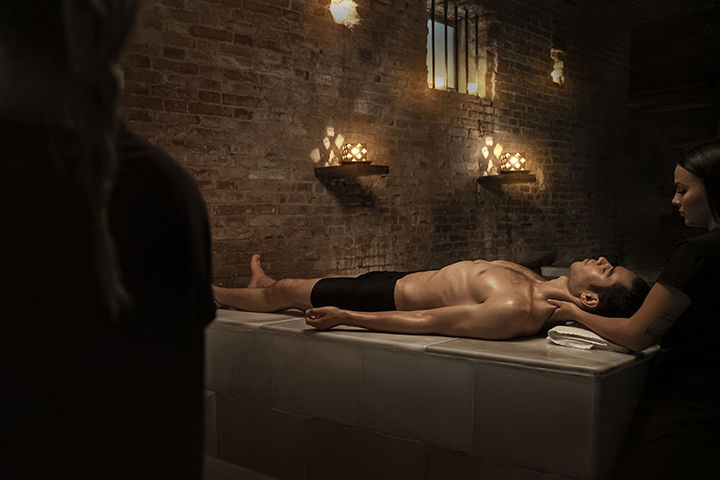 Feel relaxed but energized at the same time with this ritual specially conceived to prepare the body for sports and physical activity, or to recover from it. Designed for the pre and post physical exertion moments in which the muscles and joints require special care. - A 60 min. deep massage that begins with a cold eucalyptus gel on the lower extremities and continues, alternating with warm macadamia nut oil on the whole body, with special attention paid to the muscles most impacted by physical activity, such as the calves and quadriceps. In this massage, we utilize deep kneading to release tension, as well as different stretches, flexions, and frictions that seek to free and mobilize the muscles, including the lungs and joints. - A natural fruit juice. This is a method of active massage of medium or medium high intensity with which you will achieve a deep feeling of well-being and freedom, but not as much relaxation. The time spent on the thermal tour of the bath area and the waters at different temperatures helps to strengthen the effects of the massage.